114 Main Street, Uddingston. G71 7HZ. Tel: 01698 812106. Does the name Hood conjure up anything for you? Football fans will immediately put "Harry" in front of it and start reliving magic moments from shots this well-known Celtic player's career. Others will opt for Robin, and start thinking of Sherwood Forest, and Maid Marion and Friar Tuck. It may surprise you to know that there is now in fact a link- at Uddingston, along the New Edinburgh Road. 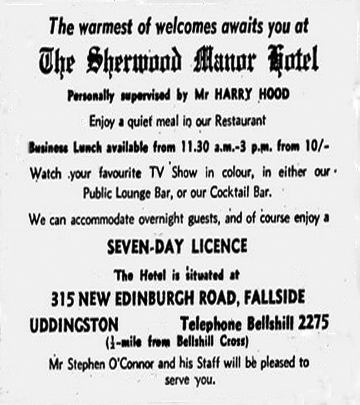 There you'll find the new Sherwood Manor Hotel, owned by that Celtic star Harry Hood, and opened last night by the Celtic boss Jock Stein, in the company of the entire fitba team. No stranger to the trade. "It's been my ambition for some time to own a pub or a hotel." Harry told me. "I was a rep at one time and so I know something about the licensed trade, and my wife's mother had a pub, so between us we know something about the business." While Harry intends to be at the hotel as much as his other commitments will allow his attractive red headed wife Kathleen, won't manage to be there at the time either. The couple have three youngsters, including a two month old baby. 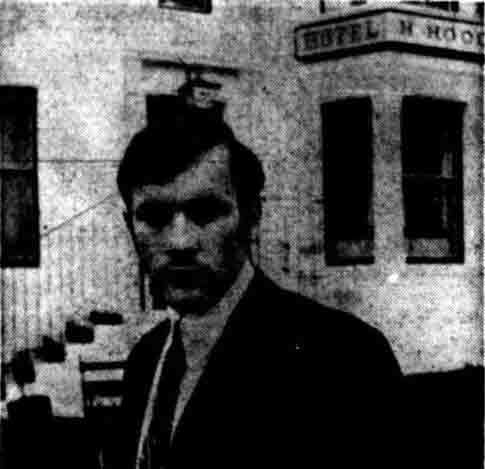 The man on the spot is Mr. Stephen O'Connor, who will manage the hotel - once called the Mirn Hotel - for the Hoods. Why the name was changed. I asked Harry why he had renamed the place. "Well we wanted a new name and Sherwood links up with our surname." he explained. "We did some delving back to try to find out what a place like this would have looked like in that part of the world. "Wood was used extensively, and so we have made use of it here. "We have used golden cherry wood in the lounge bar, It was brought specially from Japan." Positioned at vantage points around the hotel will be large leather work murals of the Sherwood Forest characters. Friar Tuck will have pride of place but the dining-room, for example and the other weel kent folk will adorn other walls. The leather work has been specially commissioned and is being done by a Falkirk craftsman. There is a colour TV in both the cocktail and lounge bars, and Harry has applied for a music licence so there may well be cabaret in the future. Remark in Bus began it all. "How did I come to choose this hotel." "I'll tell you - I overheard some people on a bus saying that the place was for sale! "I was interested at once, so I got some one to make inquiries for me. I was very impressed by what I was told and I thought the old place had very good potential - so here I am! "So far we haven't had time to do anything to the bedrooms, but in the very near future they will be modernised," his wife Kathleen told me. There are seven bedrooms, both single and double,a and bed and breakfast charges are 50s. "We've made a lot of alterations already," said an enthusiastic Harry. "The Lounge bar and the cocktail bar have both been redecorated and refurbished and we've turned the old wash-house into a dining-room." They have too! And compact through it is, they assure me they can comfortably seat 40 there. Being divided from the cocktail lounge merely by louvre doors, the two rooms can be used together to take larger parties. Aim - to give real value. Already bookings are coming in and the Hoods are delighted with everything. "I enjoy meeting people, and I aim to give real value for money," said Harry. Head cook is Mrs. Margaret Geggens, who I was assured makes the best home-made broth for miles around. The Sherwood staff includes two cooks, two waitresses, and manager Stephen O'Connor. Sherwood Mixed Grill, 12s 6d; Fillet Steak Garni, 15s; Chicken Maryland, 10s; Double Lamb Cutlets, 9s; Cold Chicken and Ham served with Fresh Green Salad, 9s 6d. "Although I knew quite a bit about the drinks side of the business, neither I nor Kathleen knew much about the food side of things," confessed Harry. So I took a course of catering lessons, and learned some of the tricks of the trade at the same time." Business lunches are served between 11.30 am and 3 p.m. and dinner between 6 p.m. and 10pm. "Our immediate plans for the future, after modernasing the bedrooms, is to build a function suite," I was told. "We have so much car parking room that some of it can easily be used for the suite." Once plans are approved for that, things should really begin to move. All the alterations to the interior of the hotel were carried out in nine days in a round the clock operation. Hary doesn't score with pub plan. Ex-Celtic player Harry Hood today moved into defence as he prepared to meet his biggest challenge match outside a football ground. Lining up in opposition to Harry, who now plays for Queen of the South, are councillors, residents and church people in the Croftfoot area of Glasgow who are against his plans to open a pub in their "dry" district. He has lodged an application for planning permission in Croftend Avenue, but this has led to a petition to try to stop the application winning approval. District Councillor Maurice Toshner has promised the objectors his full backing. "The people who live there are appalled," he said, "This is a totally residential area and a pub would be compietely wrong." But a planning official dealing with the application commented: "I think I will probably be recommending it to the committee." Hood, who already runs the Sherwood Manor in Uddingston, said: "What I plan to build will be a bit higher class than just a public house. It will be next to a shopping centre, where local people can have a coffee, a snack, and a drink if they want it." 2012... Harry Hood also owns Angels Hotel, Uddingston, The Castle Rooms, The Croft, The Dalziel Park Hotel, and The Parkville.